4 film, 4 disc collection of Airplane disaster movies with all star casts. Universal UK R2 boxset. Anyone famous in them All of the films have "all-star" casts, and you can see Burt Lancaster, Dean Martin, Charlton Heston, Gloria Swanson, Jack Lemmon, Christopher Lee, Joseph Cotten, James Stewart, and Robert Wagner, while George Kennedy has the distinction of appearing in all four films as Joe Patroni. Disaster movie fans should enjoy this set which ranges from the very impressive first film, the generic 1975, entertaining '77 and simply daft '79. Visuals All films are in Original Aspect Ratios (first three in 2.35:1 and '79 in 1.85:1) and Anamorphically Enhanced. Audio The first film includes a 5.1 and DTS soundtrack. The three sequels are presented with their original English stereo tracks which sound fine, and a variety of dub tracks. Subtitles English HOH for all discs, plus various foreign options - see the disc reviews for more. 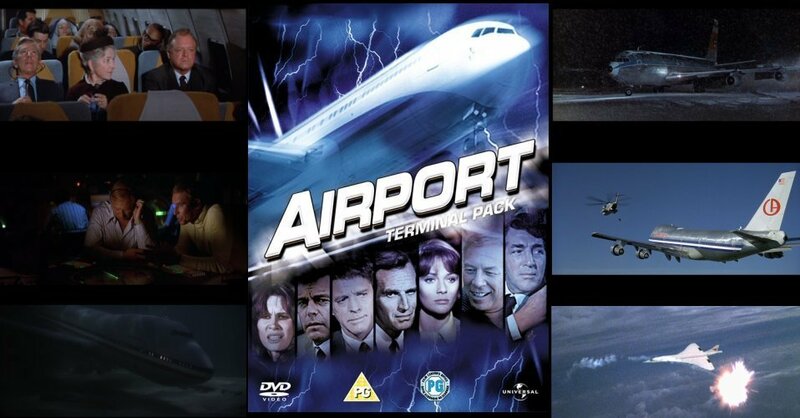 Extras Airport (1970) includes original trailer, all the other discs are barebones. Packing Contained in a 4 disc digipack, inside a slipcase. Availability The films are only available in this set. Other regions? A similar set is available in the USA, although with original trailers for all 4 films. A very varied set of films from the good, to the bad, to the simply daft. Recommended to disaster movie fans. A good looking, but barebones collection of films - sells cheaply though and worth getting as none of the films are likely to receive the special edition treatment. All text in this review written by Timothy Young - January/February 2007.